Chicago is full of enthusiasts. Whether you’re talking about sports fans, symphony goers, El riders, beach dwellers, street shoppers, or parade fanatics, they’re all here. En mass. It seems as though if there is something going on in downtown Chicago, everyone is there. While it is fun to get excited about fun things in the summer, it is sometimes exhausting and I just want to get away from the crowd of sweaty people. 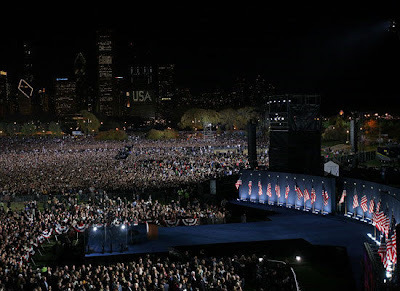 Example #1, good crowd: When Obama was elected as president in 2008, we were some of the lucky 60,000 people who actually got tickets into Grant Park along with the millions and millions of people that extended the park and went onto the streets. That was one of the best nights ever! Having so many people downtown all getting excited for one thing (well one HUGE thing) was incredible. Example #2, not so good crowd: When the Chicago Blackhaws one the Stanley cup this June, the mayor decided to have a parade for them. But, not just any parade… Chicagoans have massive parades where everyone takes the day off work, and everyone goes to the parade. 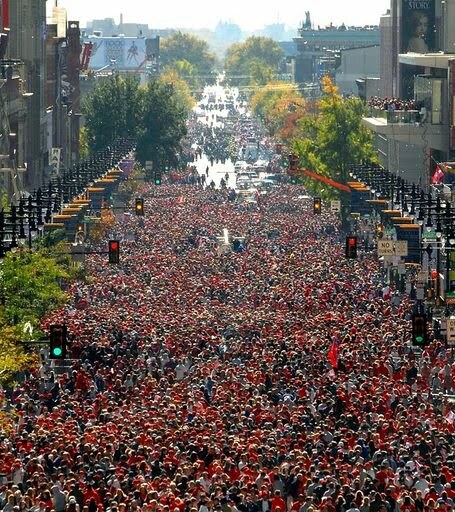 There were 3 million people flooding the downtown streets on a 95 degree day just to see the Blackhawks hockey players ride around in a bus, then stand on a stage and wave! This was not a good trip home on my roller blades! Another downfall to having so many enthusiasts in a condensed area is that if there is a craze, everyone wants in. My husband and I had an impromptu date night on Saturday when he got off from work super early. We went out for sushi (we found an amazing new place nearby) and then wanted to go see Inception. Since we live downtown and know it’s busy here, we planned to get to the theater early. But even by then all the showings were sold out until the latest one which we were too tired to stay up for. We decided that we could walk to the next nearest theater, 4 blocks away, and try to get tickets there. Nope. It was sold out just like the first one! So much for just wanting to see a movie! Too many enthusiasts once again, Chicago.